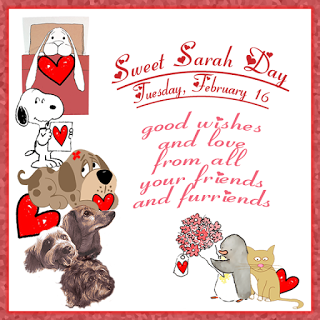 Ruby the Airedale: Sweet Sarah Day! Hey puppers, kittehs, and possums! Miss Sarah and her pack! Sendin' loves and healin' bubbles Miss Sarah! We have our paws crossed for Miss Sarah too. Pizzas and Margaritas will sooth many a worry. We hope she has some positive news soon. If not - we will be for her every step of the way. Pizzas and Margaritas would go a long way in making her happy! Very nice, Ruby!!! We sure hope all the POTP and good vibes all over the blogs bring some good news to Sweet Sarah!!! Well done, Ruby. I think that pizza and margaritas might be helpful too! Sending POTP to Miss Sarah. And my POTP too will help and all the love that I send. We are sending lots of POTP and support to Miss Sarah! We are sending her lots and lots of POTP and AireZen, Ruby! OMD you sent BUBBLES to Miss Sarah !! She will Love that... We are SURE that she is gonna Feel the LOVE of BLOGVILLE. We love Miss Sarah and are sending her all kinds of love and support! Pee Ess - We are doing a major snoopervision job today. I will bark to you about it tonight if you don't have rains. RUBY YOU ARE SO SWEET AND SO PRETTY AND SAID SUCH NICE THINGS WE KNOW FUR A FACT THAT MS. SARAH LOVED EVERY SINGLE HOP IN THIS BLOG HOP!!! GIRL WHAT YOU BEEN UP TO? HAVE YOUR MA'S INJURIES HEALED? HOW IS YOUR LEG? OKEY DOKEY MOM SAYS I ASK TOO MANY QUESTIONS. I know that Miss Sarah feels all of the Blogville love! Sending our POTP to Miss Sarah.